The Singapore Fund is a closed-end fund that is focused on equities listed in Singapore (surprise!). The fund is currently trading at a discount of ~5% of NAV and has announced an in-kind tender offer for up to 25% of all shares outstanding at a price of 99% of NAV. As is common in these kind of transactions holders of small positions are given a preferential treatment compared to holders of bigger positions, creating opportunities for those with a (very) small portfolio. The SGF tender offer has two of these mechanisms in place. There is however also a preferential treatment for people who tender less than 2500 shares. Instead of receiving odd lots of securities listed in Singapore, those holders also receive cash, but just like the bigger positions they are prorated if more than 25% of shares are tendered. That makes it harder to evaluate the expected value of going long more than 100 shares SGF, since it’s unknown how much shares will be tendered. You are certain to make a profit on 25% of the tendered shares, but if the discount to NAV returns to the 6% SGF traded at before the tender offer was made you lose a bit on EV on the remaining 75% of your position. Add in some transactions costs and going long SGF could have zero expected value. This is however an unrealistic pessimistic scenario because for all kinds of reasons not all share holders tender their shares. This can be because it’s simply impossible. In this case you can only tender more than 2499 shares if you have an account capable of receiving Singaporean securities (my broker – Interactive Brokers – can’t). But it could also be that people are perfectly happy with their position in SGF, and don’t want to sell. Past year I participated in a tender of a Russian company that was willing to buy 7.71% of stock back at a huge 50% premium. A deal that you would think no-one would be willing to pass up, but in the end the proration factor was 10.95%. Part of the reason: Russian shareholders had to tender their shares in person – standing in line for days! – while the USA listed ADR’s could be tendered with a few clicks of a mouse. But to get back on topic: there is actually some scientific evidence that proration factors, and specifically those for close end funds trading at a discount, are significantly higher than you would expect based on a 100% participation rate. This paper, that looks at a sample of 71 CEF tender offer repurchases in the period from 1994 till 2006, finds that the average realized proration factor is 79.98% versus a 25.87% expected value. And that’s in a sample where the average discount to NAV is bigger than that of SGF. While it’s hard to know what the expected value of the bet exactly is, it is a case of heads I win, tails I don’t lose (much). 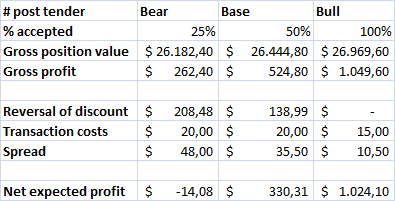 I have created the table below, based on a 2000 share position in SGF and a 2100 share short position in EWS, that shows the expected profit based on various possible proration factors. It’s important to note that the expected profit can be materially different than the realized profit because the hedge is not perfect, and there is no guarantee what exactly the discount of SGF is going to be post tender offer. But having some potential variance in your portfolio is not a problem, as long as the dollar amount at risk is not too big relative to the total portfolio value, and the variance is not correlated with your portfolio. This entry was posted in Portfolio and tagged SGF on March 7, 2012 by Alpha Vulture. Have you seen the White Mountain tender offer? At $500 per share, its the mother of all (odd lot) tender offers! There is the usual 100 share odd lot provision…Given the current discount, its the easiest $390 one can make (although it requires tying up ~49k until end of march… Lets see where this thing trades – any move further below 500 helps. Great blog – thanks for posting! That sounds very interesting, I’ll take a look! I am not positive there is an odd lot provision for less than 100 shares. the document says that Odd lot may be considered…but not a gurantee. The part about less than 2500 shares is correct…they will receive cash and not in-kind. You are right, it’s not a hard guarantee. But I wouldn’t be too worried about that if you would want to tender an odd lot. Don’t see a good reason why they wouldn’t do it, and they didn’t put in the odd lot provision for fun. odd lot should be defined as less than 100 shares. Not 100 shares or less as the author indicated. You certainly could be right, too lazy to check if it was 99 or 100 shares. Norisk tender (the 50% premium offer) was heavily participated. However, each entity can participate in the odd lot offer only once. So if you have have 2 accounts with one broker, you can only buy the odd lot in one account, not both accounts. The offer was also a little more risky than domestic tenders. The expected pay day for SGF tender is 3/30, which is one week later than expected. By calling the information agent. Does your broker charge a fee to do tender offers? Etrade is 30, Fidelity is 38. Does the author know if one has to wait for a stock to settle before tendering the shares? Ie, if the tender cut off day is today, do I have to have bought the stock 3 business days earlier? How did the author come out in this trade? 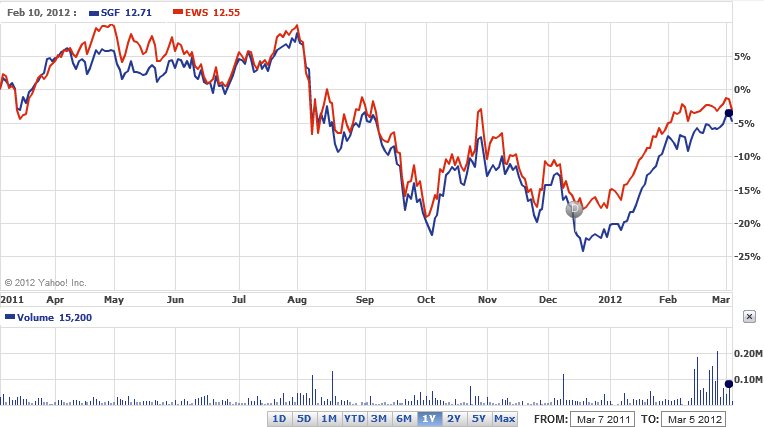 I did not hedge with EWS so I was left with about 49% of the shares I tendered. Since SGF dropped after I bought and tendered, my return at the current price is about 1% over a 20 some odd day period. Haven’t had the time to close to position yet, but will post an update on the blog next week.. I have fully closed on my position. I think this trade was somewhat mediocre mainly because it wasn’t very scalable and the longer than expected pay out time.